If convenience came in a wall plate, the Amped Classic S-Video and 3x RCA Composite + L & R Audio (White Wall Plate) would be it. Set up with the classic elements for a home theatre system, this wall plate is sure meet the needs of your audio visual set-up as your needs change. The classic white finish with smooth custom moulded design is sure to suit any existing Australian wall plates, or look a million bucks in new homes and complete renovations alike! With its unique snap-on design, installation is a breeze, too. 100% compatible with the latest standards, the Amped Classic S-Video and 3x RCA Composite + L & R Audio (White Wall Plate) is guaranteed to transmit crystal-clear signals for many years to come via the durable corrosive-resistant 24k gold plated contacts. 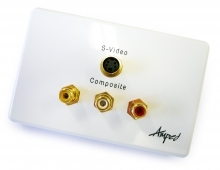 The Amped Classic S-Video and 3x RCA Composite + L & R Audio (White Wall Plate) is a favourite at Cable Chick and with both professionals and home DIY enthusiasts looking for premium quality Video & Audio transmission.